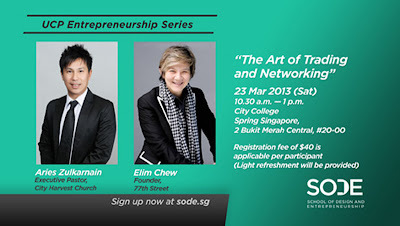 On the 23rd March, I have got the privilege to attend an up-close and personal, 2 hours session with Aries Zulkarnain and Elim Chew held at City College, organized by the cool people at SODE. Aries Zulkarnain is the director of a successful multi-million dollar family owned business in Jakarta, Indonesia. He is also the co-founder of Tarpa brand. I learnt alot from the both of them. Their passion for business and how it's so important to connect with the people we meet. 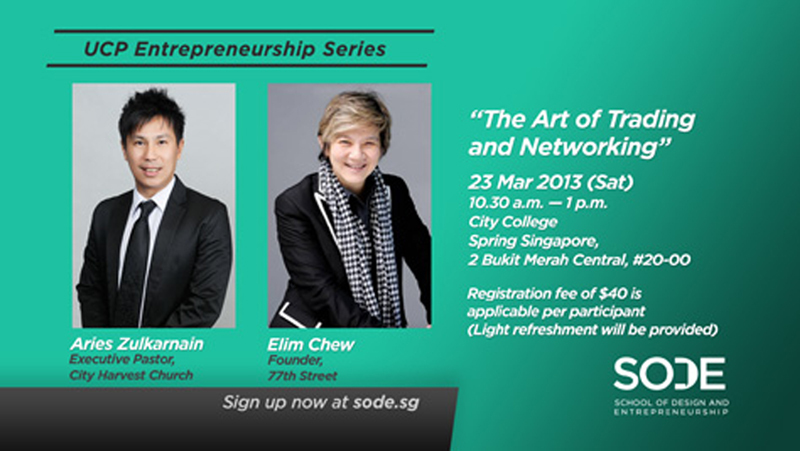 "As much as possible, there should be minimum expenditure when starting business - if possible spend none at all." "Whether we are running, having a meal; always comes back with an idea." "Never have illusions, so that we will not have disillusions. Because if I get disllusions, i'll soon lose sight of my life and visions." "Can you start out in life pursuing audacious ventures, or do you need to build reputation, relationships & resources first?" "I think everybody who creates something is doing something audacious. Because the most difficult time is when you are starting from scratch with no financial backing--just an idea. So true audaciousness comes about with just thosepeople who have the pluck and the courage to say, "Screw it; let's do it." ~ Sir Richard Branson shared by Pst Aries. You can read more of the interview at http://www.inc.com/magazine/201211/leigh-buchanan/sir-audacity-richard-branson.html.